Asdee laboured for long periods of the 1st half despite having a strong wind at their backs. However, a number of late Asdee points saw the sides go in level at the break. Thankfully the 2nd half was much higher in quality. The North kerry side looked dead and buried after John Doran was sent off and the hosts went four points clear with seven minutes of normal time to go. However, a dramatic fightback by Asdee saw them come inches from gaining a deserved share of the spoils. On a day when Sky Sports began their coverage of the All-Ireland Championships there was no shortage of excitement at Valentia Island on Saturday evening. John Kennedys men made the two hour trip to South Kerry looking for a first ever competitive victory against this opposition. 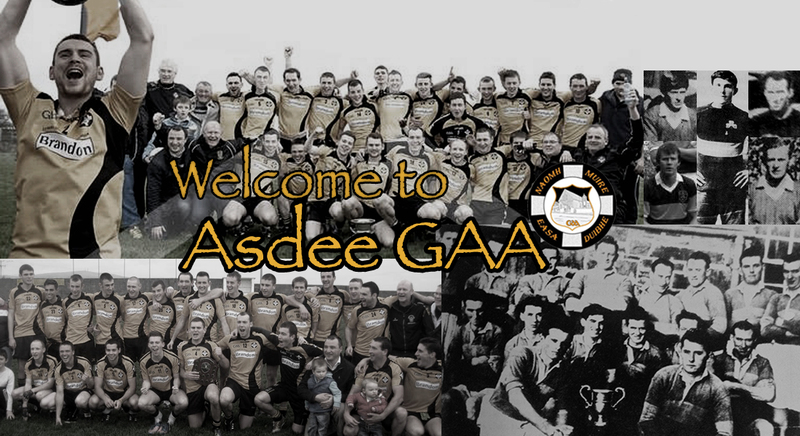 Asdee had only played once since their defeat to Knocknagoshel on the 27th April so it was understandable that their first half performance was a bit sluggish despite having the advantage of a strong wind. Valentia wnet three points up after scores in the 3,6,7 minutes. Asdee eventually settled and Eoin Kennedy and Mike Breen slotted over two fine efforts in the 12,13 minutes. Mike Breen and the Valenta free taker traded scores in the 19 and 21 mminutes. An Eoin Kennedy free just before half time sent the sides in level at the break. Asdee knew they would have to up their performance against the wind in the 2nd half and a Daragh keane point in the 4th minute set the tone for what was to be a great second half display by the men in Black and Amber.A 13 minute free from Eoin Kennedy responded to two Valentia points in the 7, 8 minutes. For large parts of the 2nd half Asdee were dominating possesion and creating more scoring chances than the hosts but some poor finishing was preventing the North Kerry side from taking the lead. Valentia had six players in the South Kerry panel the previous week and surged ahead with points on the 14,15 minutes to leave the score 0-08 to 0-06 in favour of the home side. John Doran was dismissed for a second yellow card in the 18th minute before Valentia increased their lead in the 20,21st minutes with two more points. A Mike Breen free in the 22nd minute was follewed by a Valentai point a minute later. It looked like a four point cushion would see the South Kerry side safely to victory but Asdee produced a great fightback. A Noel Long goal in the 25 minute reduced the deficit to a point before Charlie Dalton and Valntia traded points both in the 28th minute. The final whistle blew and it was not to be for Asdee. They may feel aggrieved that the referee didn’t play more injury time particularly as there were several stoppages in the 2nd half but they can be proud of a great 2nd half performance.